I'm not going to go through the usual things people say when they haven't updated their blog in, oh, I don't know... a YEAR: "I'm sorry. It's been busy. The cat ate my password..." Because who knows if I'll be able to keep this one up either. I get on kicks. I get excited about something for five minutes. I have all kinds of intentions, and then life happens. Mostly "life" is work and projects, the constant shuffling of kids. But sometimes "life" is a Real Housewives marathon. So, while I'm under no delusions that the world needs another blog, I do miss it. I miss the creative outlet, and the feeling of doing something for no reason other than you like to do it. When I think about things I'll regret on my deathbed, I'm pretty sure it won't be wishing I'd spent more time watching Teresa flip tables over. And I already do regret that I haven't been doing a better job of documenting things. So here we go again. These were taken the day after their dance recital at the beginning of summer, which is why you can still see remnants of eyeliner. I had hopes of photographing them in their cute little costumes. But Jason was out of town. There were so many details and bobby pins, I was barely able to get them there on time, let alone take time for pictures. So the next day, I decided to make up for it. 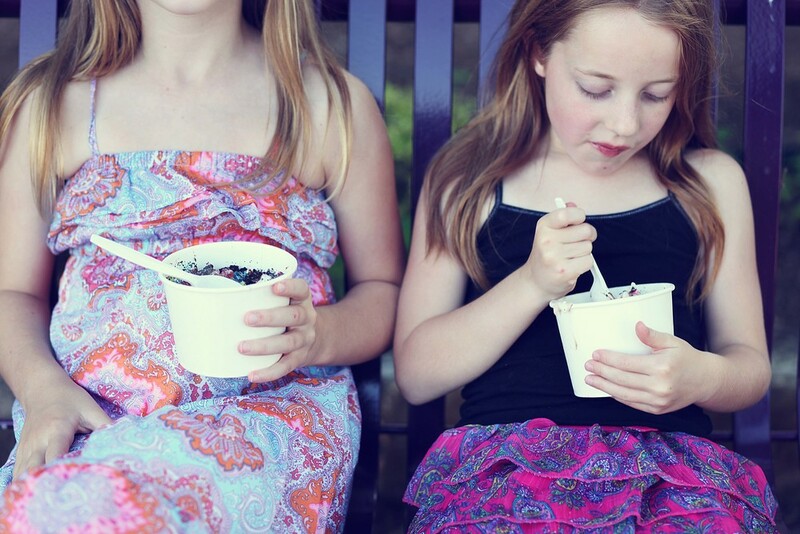 I let the girls pick out whatever they wanted to wear, grabbed my camera and we hung out in Boerne for the afternoon. We almost never take the time to blow dry hair around here, so that was an event in itself. The girls got all excited about this gum ball machine outside of this antique store. Until we looked closer and realized the gumballs were also antiques. And then Cinderella's carriage turned into a pumpkin.